Virid, a leading provider of eCommerce solutions for growing retail brands, was honored with a silver award for creative excellence on the Ron Herman website in the 2017 W3 Awards. Virid was the only company with its’ own eCommerce platform to win this award in the “Shopping” category. 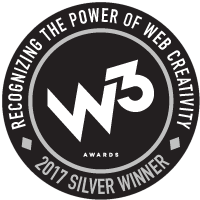 The W3 Awards honors creative excellence on the web, and recognizes the people behind award-winning sites, marketing programs, social content, mobile site/apps, and online video. Virid is a leading provider of eCommerce solutions for growing retail brands. Since 1999, Virid has provided retailers with a trusted, stable eCommerce package including software, cloud-based hosting, integration support, and ongoing technology consulting. Virid prides itself on knowing retailers and their businesses and gives them the tools they need to competitively sell in the ever-changing digital space. For more information, please visit http://www.virid.com. The W3 Awards honors creative excellence on the Web, and recognizes the creative and marketing professionals behind award winning Websites, Web Video and Online Marketing programs. Simply put, the W3 is the first major Web competition to be accessible to the biggest agencies, the smallest firms, and everyone in between. The W3 Awards is sanctioned and judged by the Academy of Interactive and Visual Arts, an invitation-only body consisting of top-tier professionals from a "Who's Who" of acclaimed media, advertising, and marketing firms. For more information about the W3 Awards, please visit http://www.w3award.com.